I stored my new jar of peanut butter carefully at the bottom of my bag. That's traveler's gold when you're about to embark on several long transportation days into the unknown. Yes, it's full of fat. But guess what? Peanut butter and jelly sandwiches don't go bad in your daypack the way most things do. And even squashed, they're still edible and don't make much of a mess, even when the jelly bleeds through the bread. 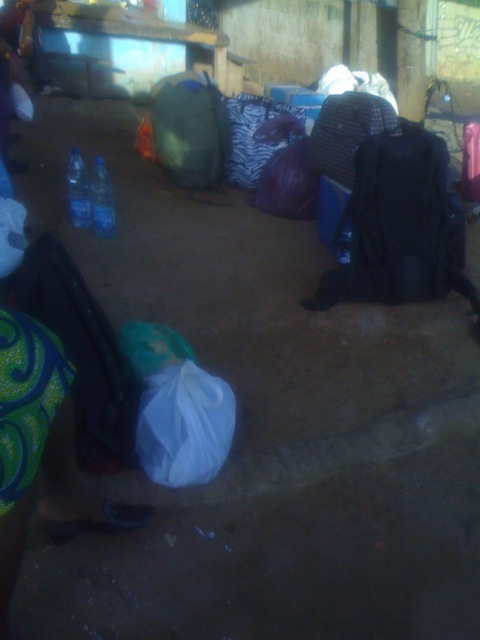 I was packing at six in the morning at the Libreville Guesthouse. Alace, one of the people who runs the guesthouse, had gifted me with the Jif and a squeeze bottle of Welch's. 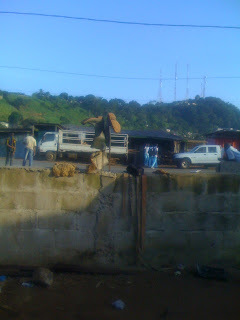 I was set for food on my journey south into Republic of Congo. Alace does not, of course, randomly hand out jars of peanut butter to every traveler who comes to the guesthouse. In fact, not every traveler is able to stay at the guesthouse—it's a great, comfortable place, cheap for Libreville at $38 a night including free wi-fi, but they only have three rooms and operate primarily as a service for staff and visitors to Bongolo Hospital. I was lucky enough that when I e-mailed, there was plenty of room for a stray backpacker. One of the staff affiliated with Libreville Guesthouse and Bongolo—a kind of local fixer—had explained to me exactly what I had to do in the morning if I chose to try the Dolisie route through Congo. I had to go at 6:30 a.m. to the Mouila Transport office. These buses were modern, air-conditioned and not oversold. The bus would not leave that early, of course, but Libreville rush hour traffic was to be respected. If I left too late, I'd end up sitting in traffic for ages, trying to get to the bus. I got the second part right, and left at 6:30. But after that...well, sometimes you just shrug and let the road take you where it will. I was only partially sure I'd made the right decision in trying this route. "Maybe I should go to the train station instead," I thought. But I had instructions for this option as far as Dolisie. Going the other way could mean sitting at the border for days, hoping for a lift from Gabon to Oyo, where I could catch an onward bus. I don't speak much French, and anyway, my accent in French invariably sounds like something else—German, Spanish, American. Today, when I asked for Mouila Transport, my taxi driver took me to—predictably—transportation bound for Mouila. That's a perfectly reasonable interpretation, right? The crappy mini-bus bound for Mouila that I ended up with was no worse than any other mini-bus that I'd been on in the last few months, and I was too tired to keep trying to get to the right company. Also, I suspected all I would do is confuse the taxi driver and never get to where I wanted to go. I'd scored a window seat in the middle row of a three-seat bench filled with four—not really a good location for knees or toilet stops, but that didn't stop me from asking the other passengers to get out and let me off the bus about an hour into the trip. A young mother with a toddler and I were the only women needing a pee break that time, and the bus conductor noticed that while the men all stood off to the right of the road, there was no coverage for squatting women. He motioned us to follow him up a dirt drive, where he asked a rural Gabonese man for permission for us to pee behind his house. We did, both giggling together at the awkwardness. We were like dogs on a walk. The toddler looked as us both, baffled. What was so funny? But that bonding-experience wasn't enough for the toddler to trust me later when the mother left her with me while she went to buy some milk. The kid burst into tears in less than 45 seconds. I froze...if I touched the kid, she'd probably scream. If I didn't, she'd just continue to cry. What's a terrifying white woman to do? Mom returned, unable to hide her amusement at her cute kid, who recovered with her mother's attention. The other passengers and storekeepers nearby howled with laughter at me or the kid, or both of us. This mini-bus certainly wasn't the rumored A/C transport of Mouila Transport. Ventilation was from open windows, which never does wonders for hair (I try to limit the tangling with a scarf) and always leaves an oily film on my skin. My knees were killing me by the fifth hour of the journey. The conductor switched seats with me when it become obvious that I was in pain—I could barely get in or out of the van. It wasn't until later that I realized my sandal straps on my Tevas were too tight. I only wear these when I think it might rain, so I hadn't worn them much until Cameroon. And it was raining regularly these days. Briefly, but with drama. It's the rainy season in central Africa. The torrents begins with incredible winds and lightning, and then 20 minutes later, there's no evidence they ever existed aside from puddles and clogged drains. I was heading to Mouila because it's the last major town before Ndende, which is where I needed to get stamped out of Gabon before proceeding to the border with Congo. Two hours separate Mouila from Ndende (measuring in kilometers or miles is pointless as it doesn't account for road conditions). I needed to be in Ndende before noon, as the immigration police close up shop from noon to 3 for their absurdly long lunch. Should I be pushing on, to stay tonight in Ndende? Maybe. But Mouila is a major town and also the local hub for transport to Bongolo. The man at the Mouila taxi rank had even asked if I was going to Bongolo. I'd said yes. It was easier than explaining that I'm a tourist heading to South Africa. I'd nearly gone to Bongolo, just to see this large hospital that had been doing bush medicine for decades, but the guesthouse had been full. We'd reached Mouila in late afternoon, between 5 and 6. I'd left the guesthouse in Libreville at 6:30, but the mini-bus hadn't started moving until 9:30. Long, uncomfortable day. The bus driver and conductor asked me where in Mouila I was going. They conferred and decided to take up my cause, and that of a couple also on the bus, first showing us a serviceable military hostel which wasn't all that serviceable. It was too far from the center of town, where I needed to be if I wanted to use the internet or eat. The couple agreed. The staff next took us to the best place in town, Hotel du la Lac. Now we were all happy. The couple balked at the price, which was $32, but they left, went elsewhere, and returned 15 minutes later. Hotel du la Lac was indeed the nicest place around. That's not to say that it's spectacular. It was fine, that's all. A little rundown, a broken light in the bathroom, broken tile around the drain. But the room was clean, safe, had A/C, and even had hot water. And had the novelty of a toilet seat. And best of all, the lobby had free wi-fi. No traipsing around town for me. Plus, the restaurant turned out to be pricey but the best I'd been to since Mali. A server came to my table. "What would you like," she asked me in French. She recited a string of dishes to me quickly. Oh no, I haven't a clue what's on offer. Then the actual cook, a grandmother in a colorful cotton dress, stepped in. She spoke to me in slow, carefully enunciated French, which was easy to follow. She'd spoken to foreigners before. I'd soon find out she cooked even better than she spoke. "What would you like," she said. Startled, I stared for a moment, then caught my breath.